MOSCOW - Prime Minister Shinzo Abe’s attempt to quickly settle a decadeslong territorial dispute with Russia, and thus boost his political legacy, appears unlikely to bear fruit, with no substantive progress announced after his talks Tuesday in Moscow with President Vladimir Putin. The two leaders, who have now met 25 times, reaffirmed their determination to conclude a postwar peace treaty by settling the row over a group of Russian-held islands off Hokkaido, but they also admitted they have a tough road ahead. Itsuro Nakamura, a professor of Russian politics at the University of Tsukuba, said Putin has no intention of handing over any of the contested territory. “I believe Mr. Putin is merely dangling the territorial issue as an enticing carrot in front of Mr. Abe” to drive a wedge in the Japan-U.S. security alliance. Nakamura said Abe’s rush to achieve results by the end of his term of office in 2021 has put him in a disadvantageous position. Putin has no reason to move quickly to settle a dispute, which has been left unresolved so far for more than 70 years. At the Moscow summit, Abe and Putin confirmed their earlier agreement to speed up peace treaty talks based on a 1956 joint declaration that calls for the handover of two of the four disputed isles. The four islands, known as the Northern Territories in Japan and the Southern Kurils in Russia, were seized by the Soviet Union following Japan’s surrender in World War II in 1945. Tokyo maintains that the islands were illegally occupied by Moscow, and seeks the eventual return of all four, but Russia has urged Japan to recognize that it gained sovereignty over them as a result of the war. 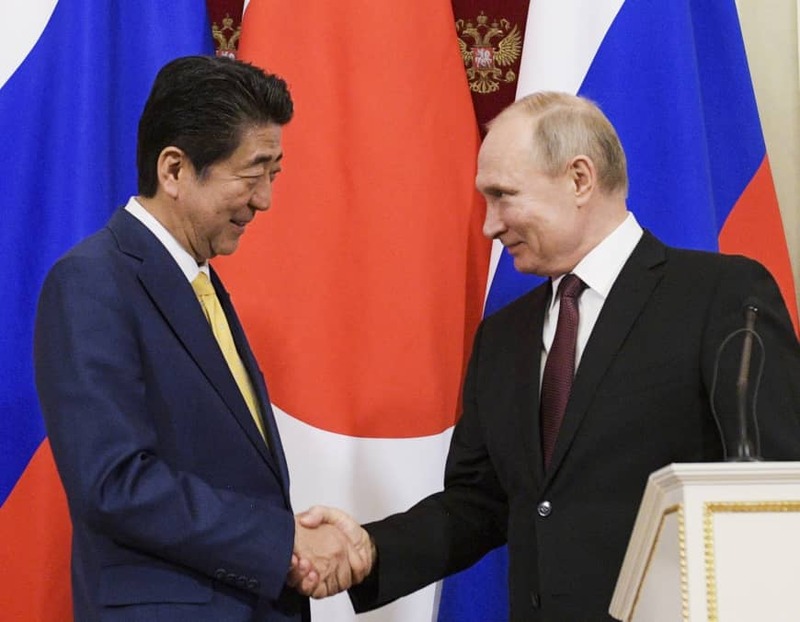 Abe is pursuing a broad agreement with Putin in June, when the Russian president is expected to visit Japan for the Group of 20 summit in Osaka. Japan’s 64-year-old leader is desperate to leave a legacy beyond becoming in November Japan’s longest-serving prime minister, political pundits say. Moreover, a breakthrough in the peace treaty negotiations, along with a successful hosting of the upcoming G20 summit in late June, are seen as important for his Liberal Democratic Party to clinch victory in a House of Councillors election likely to be held later in the summer, observers say. 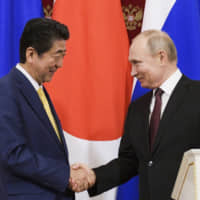 Taking into consideration Russia’s hard-line stance, Abe is leaning toward accepting a peace treaty if the smaller two of the contested islands — Shikotan and the Habomai islet group — are handed over, sources in the Japanese government have said. The 1956 declaration states that Shikotan and Habomai would be transferred to Japan following the conclusion of a postwar peace treaty. But it does not mention the islands of Kunashiri and Etorofu, which together account for 93 percent of the total area of the disputed territory. As the Japanese government has not officially admitted to a shift in its strategy on the territorial row, Abe will need to explain the new policy to the public, since it would lead to giving up Tokyo’s sovereignty claims to the two larger islands. “There is zero chance for Mr. Putin to accept the return of Kunashiri and Etorofu,” a senior Japanese government official said, citing their strategic importance. Russian experts in Japan also raised doubts over Putin’s seriousness about transferring even a tiny part of the country.”I don’t understand why Mr. Abe believes Japan could get Habomai and Shikotan in exchange for abandoning claims to Etorofu and Kunashiri,” said Akihiro Iwashita, a professor of Russian foreign policy at Kyushu University. Iwashita said that as Shikotan is home to 3,000 Russian residents, it is unimaginable for Moscow to hand it over to Japan. In contrast, only border guard members are stationed on the Habomai islet group. Ahead of Tuesday’s summit, rallies were held against the return of the islands in Moscow and elsewhere, with one in the capital Sunday drawing hundreds of protesters. It is necessary for Putin to assess public opinion and deal with growing opposition to any handover of the islands. Nakamura at the University of Tsukuba also suggested that Putin is seeking to lure Abe to the negotiating table because he wants to undermine the Japan-U.S. security alliance, and scale back the U.S. military presence in Japan to reduce its threat to Russia. Putin has expressed concerns about possible deployment of American troops on the contested islands if they are transferred to Japan. Abe may be compelled to perform a delicate balancing act between Washington and Moscow if Putin asks him to do more to ease Russia’s concerns over the U.S. military presence, Nakamura added. How Japan will proceed in the negotiations with Russia has become a matter of concern beyond bilateral relations. Ryo Sahashi, a professor of international politics at Kanagawa University, said that the United States and European countries, which have imposed economic sanctions on Russia in the wake of its annexation of Ukraine’s Crimea region in 2014, are monitoring how close Japan becomes to Russia. If Tokyo is seen as drawing too near, Abe’s attempt to quickly settle the isle row could have a negative impact on the “united front against Russia,” as those countries believe Moscow has rattled the international order through the annexation of Crimea and other incidents, Sahashi said. “The international community expects Japan to be a champion of the international order. What runs counter to such an expectation could tarnish Japan’s public image,” he said.